Meritamun was a young woman who died around two thousand years ago. 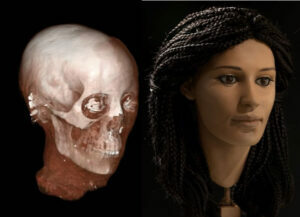 This video shows how the use of CT scanning of her mummified head together with 3D printing, archaeologists and sculptors have recreated her face using a technique known as forensic facial reconstruction. A truly fascinating way to use modern technology to bring the past to life. It is great to see modern methods investigating things from an ancient culture which was, in its day, on the cutting edge of science and technology. Thank you for sharing this wonderful video. I find it amazing how the very talented sculptor was able to let us see how this Egyptian Woman looked. I have seen this done on other skulls from other times especially from those found in the original Jamestown Colony here in the States. It is a special peek into the past. What a wonderful transformation, such beauty from a 2000 year old scull would not have thought such things possible! Just goes to show such beauty has been around for such a long time. Hmmmm. How true can this be, if we continue to allow non descendents of the Egyptian culture to tell the story of the Egyptians, will we ever get the truth? This is just amazing. She is really beautiful. The thing I find most intriguing is that having been to Egypt many times and seen the faces of the citizens both far and wide where did the delicate structure and obvious non Arab features come from? This girl is a beuty but of what race I wonder? JIm Wood. Silly me, Of course 2000 years ago she would have been alive during Caesarian’s rule and could have been from any of the Mediterranean regions or even Roman . it would be interesting to apply the technique to a much older skull and compare the result. This young girl ‘s name threw me as it it is apparently Egyptian in relating to amun. Really nice to see how the technic can show us these images from the real past. abel pardo… you really believe that a computer can show us the image of a person whos been dead for 2000 years? Why is “our” time period so obsessed by “race”? The sculptress worked from a 3D print of the skull, placed markers relevant to muscle and tissue depth/placement. Other factors were thence “borrowed” from today’s Egyptians to give a more complete translation of bone to face. I happen to believe she did a remarkably fine work.